Presentations help exploit the potential of our ideas in the most obvious way. There are many different programs and services that help us design and create presentations. Some people use the standard applications and tools that have long proven themselves in the market, such as PowerPoint, Google Slides and others. However, there are cloud services that offer a non-standard view of slideshow creation. 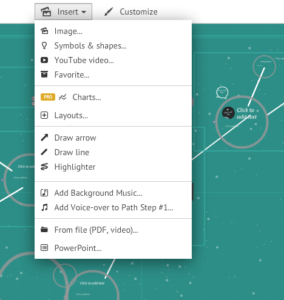 One of the best examples of such tools is Prezi.com. Prezi is an analogue of a whiteboard, which will help reveal the essence of your ideas in a clear way. You will understand the advantages of the service right after you start using it. To register a free account you will need to click on the link and fill in a few lines and enter your e-mail. You can also use your Facebook or LinkedIn account to reduce registration time. Once you log into your account, the main My Prezis section will appear, with all of its functions. You can start your project with a white sheet, by clicking Create New Prezi, or use some ready-made templates. Also in the future, you may want to access your Prezis – you may do it in a simple way. To the left you can see a column in which you can highlight folders: they will help sort all your materials and keep your workplace in order. This section is a special feature of Prezi.com: it contains a lot of presentations from other users. If you want to find a ready-made presentation on a specific topic, the Explore section will help you. To navigate through it, use the search bar. Under each presentation we show the number of views and likes, which may help you choose only the most high-quality projects. On your public profile page, you can display presentations you want to make available to all users. Sometimes you cannot figure out what went wrong or how to turn on a particular function. The section Learn and Support will help you understand the service functionality: it contains a large number of tutorials. If you want to get an answer to a particular question, you can enter it in English in the search bar. Now let’s get back to the section My Prezis and use the Create New Prezi button. After a short while you will see a screen on which you can either choose some ready-made templates (to get more templates click More) or start from scratch, by clicking Start Blank Prezi. Let’s use the template Nodes as an example. First, look at the left column of the editor. It is designed to navigate between the individual parts of the presentation. By dragging elements you can change the order in which they play. At the top part of the column, there are sketches of elements which will continue the chain of the presentation’s links. 2. Next, consider the Insert feature. 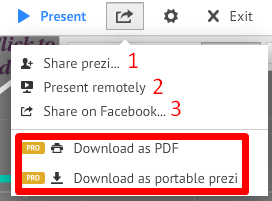 Once you open a tab, you will see a list of items that you can add in the free version of Prezi.com. The most interesting and informative features are video downloads from YouTube and adding PowerPoint presentation slides. Also, you can add an audio file, an image, a PDF file or a video from your internal memory. Here you will find Themes for your presentations. There are many different colors, fonts and styles available, which are all ready for use. If you find the desired theme but don’t like its color or font, simply click the Advanced button and configure it for your needs. In this menu, you will find ways to share your presentation. In the free version of Prezi.com, you have the first three points. Here you can share your work with specific users. This function is similar to file sharing, which is available in Google Slides. Thus you give your colleagues specific permissions: either to view or to edit your presentation. Then just send them a link to your Prezi. Send a link to your future audience. Note that you yourself control the navigation. Finally, of course, you can share your Prezi on Facebook. Prezi.com is a modern tool offering a new look at presentations design as well as demonstration of their capabilities. The service not only has a lot of useful functions but also boasts a large knowledge base which it’s ready to share with users.